Meatloaf lovers, this moist Classic Meatloaf recipe is the ultimate comfort food. Dinner has never tasted so good. Suitable for people following a Gluten-Free diet. Post includes Weight Watchers points. Today I am taking you all back to the Classic Meatloaf recipe. But of course, me being me, I have gone and added a little twist to the recipe, And it is all the better for it. So welcome to my Air Fryer Meatloaf with a whole load of chorizo in it. This classic meatloaf is one you want to add to your menu like yesterday. It is the perfect comfort food that the whole family will love. Bonus is that is in the always lick your plate clean kinda category, especially when served with a whole heaping of creamy mashed potato. Leftover meatloaf, stuffed in some bread, makes a great lunch meatloaf sandwich that adults and kids alike will love. I have found that the secret to the perfect meatloaf is using a combination of ground beef and ground pork, but please do use whichever combination of meat that you prefer. 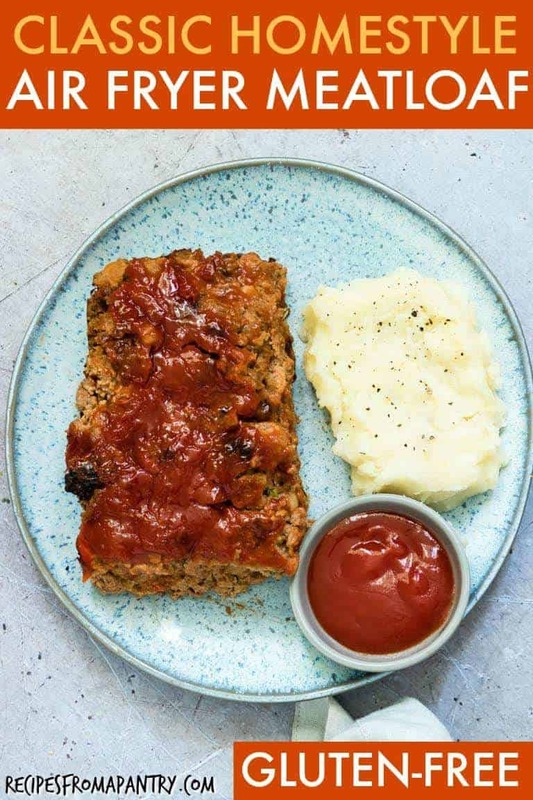 The chorizo adds a smoky depth of flavour to your meatloaf that makes it go from seriously good to ‘wow’. The awesomeness of this recipe is that you will end up with a moist meatloaf without any effort. 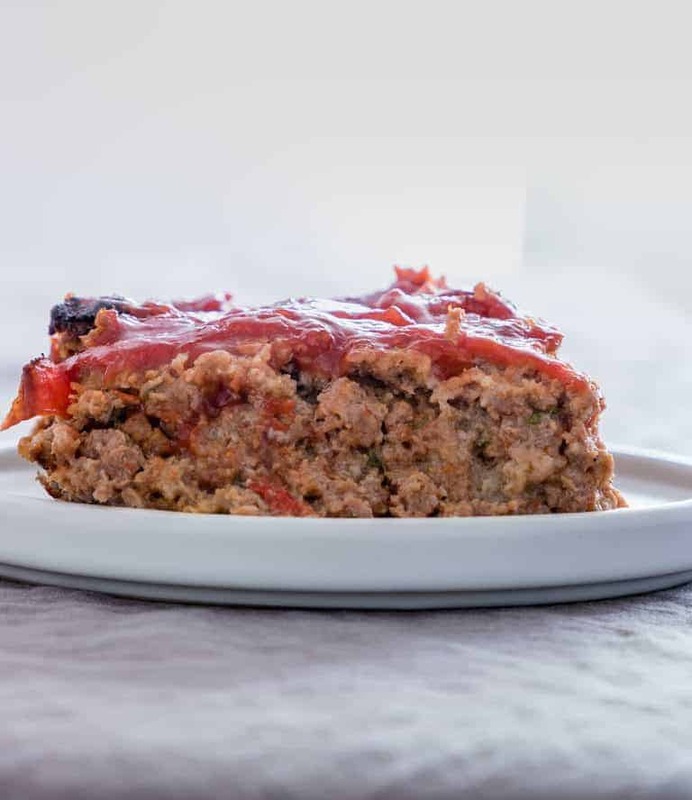 The grated onion and grated bell pepper do all the hard work for you and make that meatloaf super moist. Use the knife for cutting meat and veggies. Use this handy spatula for stirring the meatloaf mix. Measure out your spices with these measuring spoon set. Mix your meatloaf in these mixing bowls. 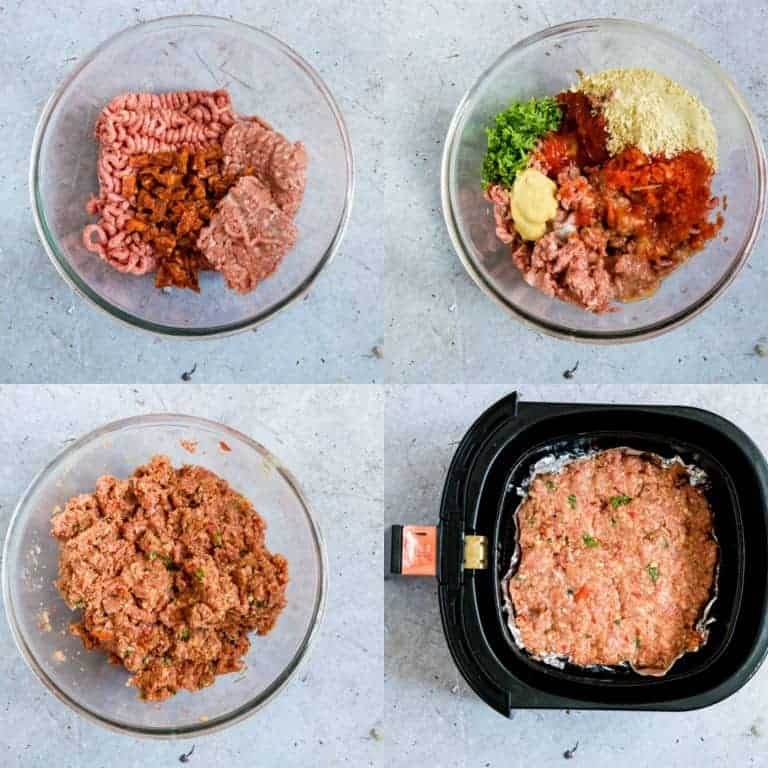 Try this spice kit for different flavours in the meatloaf. 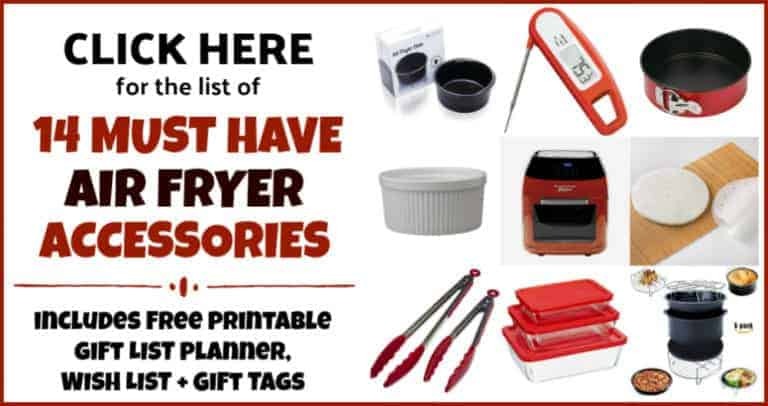 Please check out my must-have list of Air Fryer accessories. There is something for everyone. 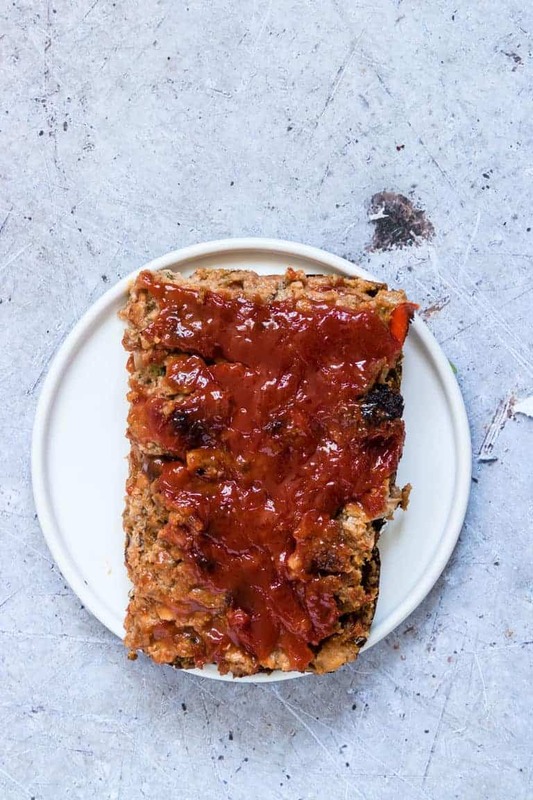 So ready to whip up an easy classic Meatloaf Recipes, then gather all your ingredients and let me show you…. Preheat air fryer to 390F / 200C degrees. Mix the ground pork and ground beef and chorizo in a bowl. Then add the rest of the meatloaf ingredients into the bowl and combine. Then add the meatloaf into a loaf pan or shape into a loaf and put into a shaped aluminium foil that goes around the meatloaf. Place the meatloaf in the air fryer and cook for about 20 to 35 minutes. (Use a meat thermometer to check for doneness). Whilst the meatloaf is cooking mix the glaze. About 5 mins before the meatloaf is done, spread the glaze over the meatloaf and cook till done. Remove the meatloaf from the air fryer and let the meatloaf stand for 10 mins before serving. You can vary the percentage of ground beef and ground pork. Make sure you grate the onions and peppers very small so that they cook through. Other veggies you can add in include grated carrots, mushrooms etc. You can add in other spices to your taste. 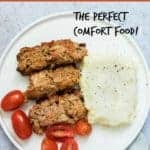 To make this Air Fryer Turkey Meatloaf instead, simply swap out the ground pork or beef with some ground turkey and you are good to go. 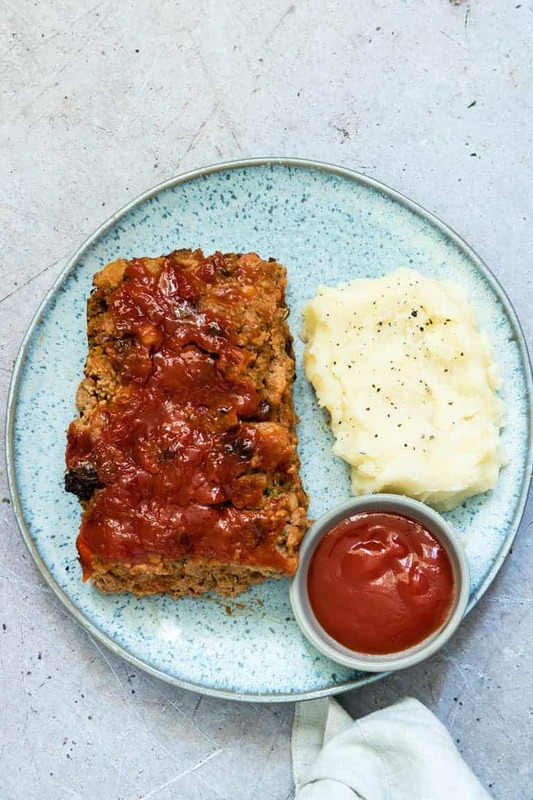 This is already a gluten-free meatloaf recipe because I use gluten-free breadcrumbs which can be got from the free from aisle in the supermarket. I have a friend who has used toasted outs instead of breadcrumbs too. I have heard other people use almond flour. Crispy Air Fryer Brussels Sprouts. Taking the time to meal prep at the beginning of the week is a great way to save time when it really counts on those busy weekdays. You can easily keep your family fueled throughout the week by packing healthy, wholesome and tasty lunches. And Air Fryer Meatloaf really is the ideal meal prep ingredient. 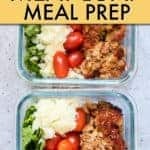 It is sooooo is fast and easy to make up a batch to use for meal prep at the beginning of the week. 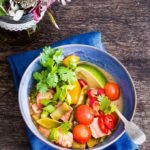 And since it will stay fresh and tasty stored in the fridge, you can make up all sorts of wholesome meals that will be ready to go just when you need them most. There are many different storage options available, but these are the ones I come back to again and again and work best for all my meal prep needs. 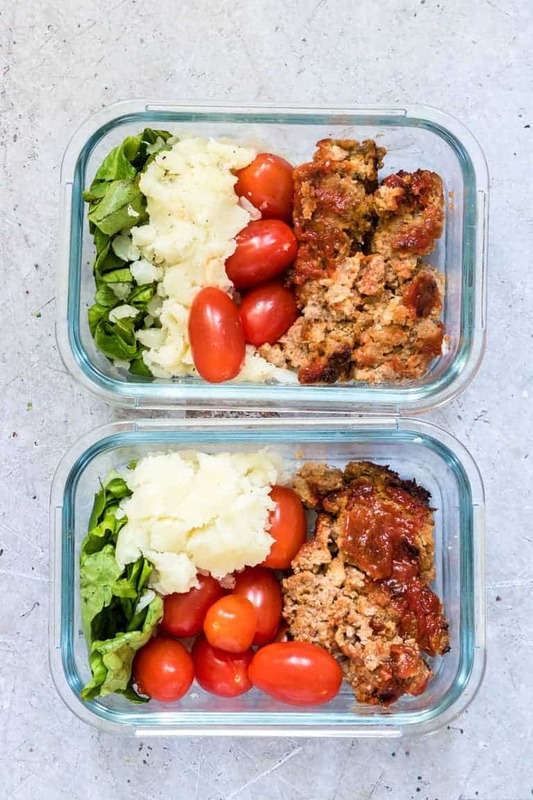 Glass Meal Prep Containers with 1, 2 and 3 Compartments – Having 2 compartments is perfect for those build-it-yourself lunchbox ideas, or when you prefer to keep flavourful items separate. And single compartment containers are just the thing for making up meal prep bowls. These glass meal prep containers are freezable, microwavable, and dishwasher safe. Reusable sauce cups with lids– to keep your food from getting soggy, it is important to store salad dressings, fat free yoghurt and salsa, etc. separate from the other food until mealtime. The 1-ounce size will right inside the larger glass containers. Reusable Utensils–there are lots of cute, packable reusable utensil sets to choose from. Some even come tucked inside a cloth napkin. Reusable Water Bottle – stay hydrated and healthy with these fun portable water bottles. Insulated Lunch Bag – pack up your glass container, utensils and water bottle in this insulated and easy to carry bag and head out the door! 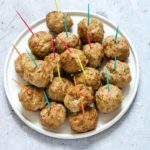 You really can pair Air Fryer Meatballs with just about anything to create a wide variety of make-ahead meals that taste amaaaaaazing and are good for you too. 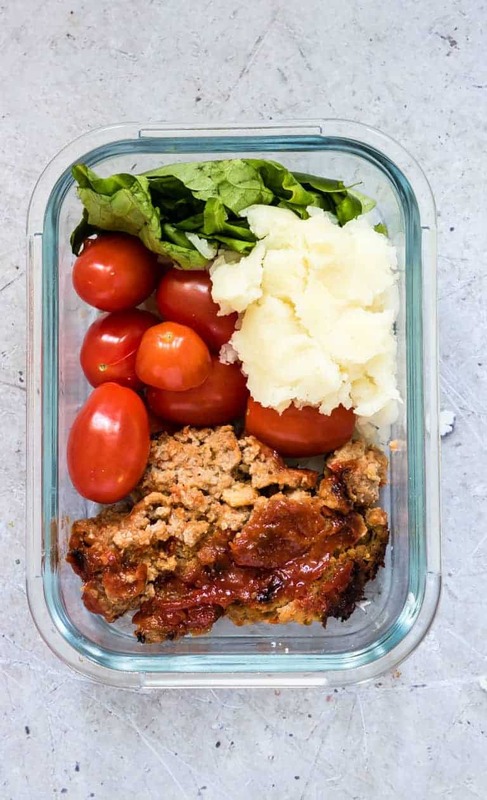 Air Fryer Meatloaf Bowl (pictured): Air Fryer Meatloaf + Salad Greens + Cauliflower Rice + Tomatoes. Instant Pot Sweet Potatoes: Adds extra sweetness. Instant Pot Quinoa: Adds some bulk. A Meatloaf Sandwich : Air Fryer Meatloaf + Quinoa + Roasted Veggies + Green Goddess Dressing. There are 10 Freestyle points in a serving of Air Fryer Meatloaf. Thank you for reading my Air Fryer Meatloaf recipe post. And please come visit again as I continue dreaming up recipes, traditional African recipes, African fusion recipes, Sierra Leone recipes, travel plans and much more for you. Thanks for reading Recipes from a Pantry, UK food blog. 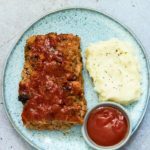 Don't forget to tag #recipesfromapantry on Instagram or Twitter if you try Classic Air Fryer Meatloaf! It is really, really awesome for me when you make one of my recipes and I'd love to see it. You can also share it on my Facebook page. Please pin this recipe to Pinterest too! Thank you for reading Recipes from a Pantry. Then add the rest of the meatloaf ingredients into and combine. Then add the meatloaf into a loaf pan or shape into a loaf and but into a shaped aluminium foil that goes around the meatloaf. There are 10 Freestyle Points in a serving of Air Fryer Classic Meatloaf. Air Fryer Meatloaf Bowl: Salad Greens + Cauliflower Rice + Tomatoes. A Meatloaf Sandwich : Air Fryer Meatball + Quinoa + Roasted Veggies + Green Goddess Dressing. 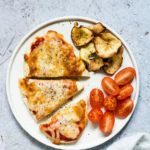 I adore meatloaf and I have really been wanting an air fryer lately! I have to get one. This looks nice and crisp on the outside and soft and moist inside! Delicious recipe! this looks delicious! 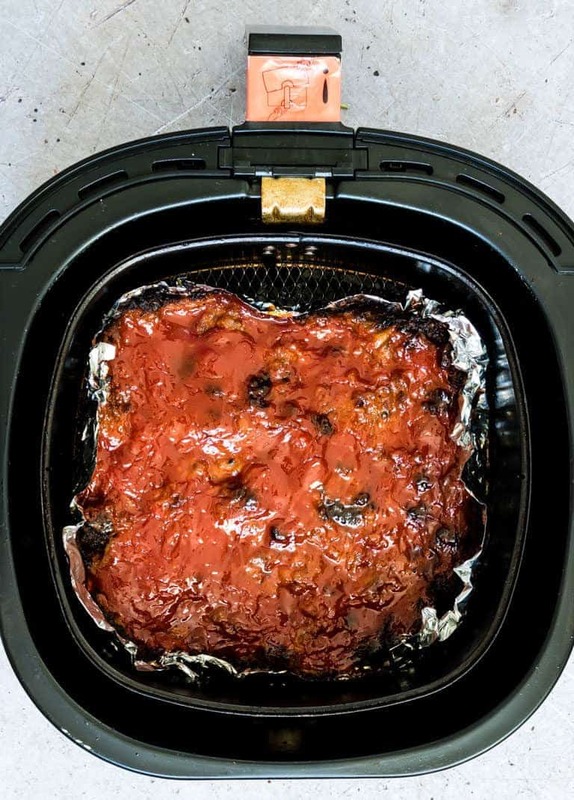 I never would have thought of cooking meatloaf in an air fryer, but it’s brilliant! 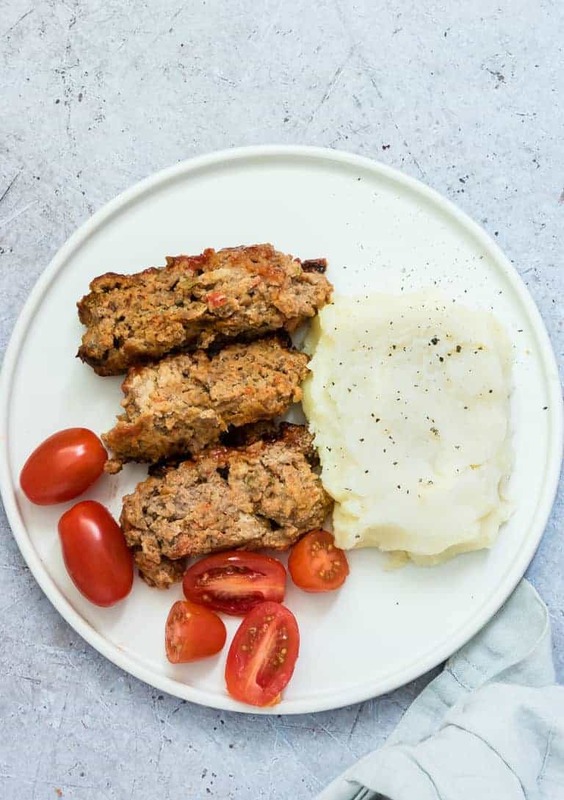 Meatloaf isn’t really something we have but this looks tasty and I can see it being great for meal prep. 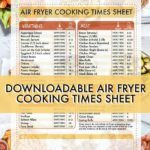 I am always looking for new recipes to try n my air fryer! Can’t wait to try this one! Whoah! Meatloaf in the air fryer? Who knew? Looks delicious and satisfying too. Thanks for sharing!